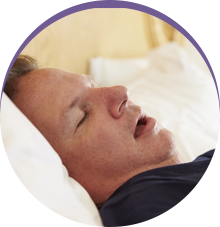 Sleep Apnea is a chronic condition that not only affects your nightly sleep, but your overall health and well-being, too. A person with sleep apnea may stop breathing during sleep for a few seconds or even up to a minute. As this repeats throughout the night—even hundreds of times in some extreme cases—the cumulative effect on your body is significant. Initially, the most noticeable effect may be how tired you feel during the day. This is no small consequence for people who have sleep apnea in Plano, TX. Just think of the traffic and construction on Dallas’ streets and highways that you may have to contend with during a normal day. Being alert and able to react quickly is imperative. In fact, studies show that sleep apnea is a leading cause of automobile accidents. In addition to tiredness, there are numerous other side effects of sleep apnea. When breathing stops even for a few seconds, carbon dioxide begins to build up in your bloodstream. To remove the excess carbon dioxide, your heart needs to pump harder, which stresses the heart repeatedly through the night. Hypertension, or high blood pressure is another consequence of sleep apnea. This often is a result of the added work the heart must perform to remove carbon dioxide from your bloodstream and compensate for the lack of oxygen. Left untreated, high blood pressure weakens the heart, so that blood is less forcefully pumped and your body may not be able to function properly. According to research conducted at Stanford University School of Medicine, people who sleep less are more likely to have a weight problem. Researchers found that lost sleep leads to increased levels of ghrelin—the hormone that triggers appetite in people—and reduced levels of leptin, the hormone that tells your brain that you’re full. Thus, people who have sleep apnea are often plagued by weight gain to the point of obesity as well. And at the University of Chicago, a study shows that there is a “clear, graded, inverse relationship” between sleep apnea and diabetes. In patients with type 2 diabetes, the severity of sleep apnea and the level of glucose control are inversely related. For some people with sleep apnea, depression is another debilitating consequence that may go undetected because the symptoms of depression—fatigue, mental fog, low energy, trouble concentrating, irritability, feeling sad—can be similar to some of symptoms of sleep apnea. Many people find that when their sleep apnea is treated, their depression lifts. 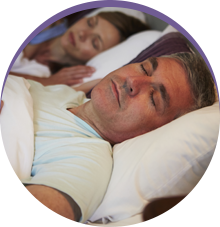 At Sleep Rehab, Dr. Fedosky and his team help patients overcome sleep apnea with an oral appliance that is worn overnight while you sleep. 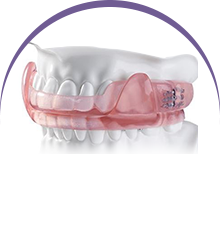 Made of smooth plastic, this appliance gently shifts the mandible jaw and tongue forward, thereby opening your breathing passageway. We’ll have a customized appliance fabricated for you, so you can be sure yours will fit comfortably. Contact Sleep Rehab today to find out how we can help.